Magner CDS 909 - Technology Unlimited, Inc.Technology Unlimited, Inc. 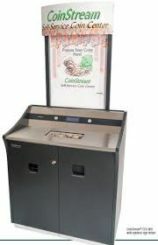 The Magner CDS 909 self-service coin sorter is an easy-to-use, self-service lobby coin sorting system. The Magner CDS 909 allows visitors to sort their loose change into denomination specific bags. Saves time and money by eliminating the need for teller interaction.